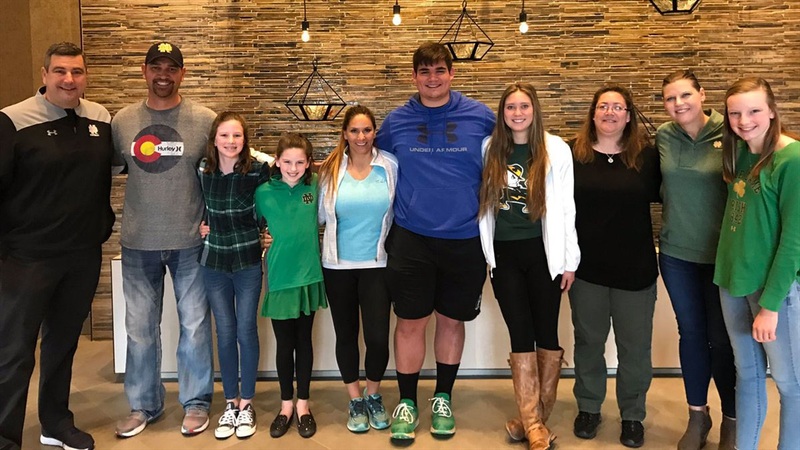 2020 J.K. Mullen (Colo.) defensive tackle Aidan Keanaaina‍ committed to Notre Dame in February and made his return to South Bend for an official visit over the weekend. The four-star prospect worked hard on fellow 2020 defensive linemen Braiden McGregor‍ and Rylie Mills‍, but 2020 four-star receiver Jordan Johnson‍ stole the show on Saturday night as he committed to Notre Dame. In fact, Johnson’s commitment happened right next to the 6-foot-3, 305-pounder at Brian Kelly’s lake house. As for his visit, Keanaaina couldn’t be happier with his decision and the return to South Bend only solidified his already firm pledge to the Irish. “It was good and I really enjoyed it,” said Keanaaina. “I had a great trip. Keanaaina admits he might have gained 10 pounds as Notre Dame made a point to feed him non-stop, but as much as he enjoyed the food, the Colorado native enjoyed spending time with his future teammates and coaches more. “It was amazing,” Keanaaina stated. “They had games and great food. To see Coach Kelly’s house and get around his family a little bit was really nice. He has a great household and a great atmosphere out there. All the coaches came out and I got to see some of the players again. The chance to be around current members of Notre Dame’s defensive line meant a lot to Keanaaina and he saw they want and work towards the same goals he wants to achieve. Keanaaina also was at practice on Saturday morning and got a chance to see Notre Dame defensive line coach Mike Elston coach up his defensive line. With his return to campus, Keanaaina also put his recruiting hat on as McGregor and Mills were taking official visits. The three were almost inseparable during practice, but Keanaaina didn’t want to put pressure on them to commit. “They are amazing guys and quality athletes,” Keanaaina explained. “They have their head on straight, genuine and I’d love for them to be my teammates. I told them I’m not going to pester or pressure them because I was in the same position. I told them to enjoy it and do what they want to do. Keanaaina admits he wanted all to be attached to the hip of McGregor and Mills this weekend, but he didn’t have to try as the relationships formed organically. “I would say consciously I wanted to get that going, but then again, we just hit it off,” stated Keanaaina. “We weren’t even talking about football. We started talking about family, friends, high school experience and we were talking as good friends. I really enjoyed that and it’s one thing that really showed. The J.K. Mullen star will now turn his focus to preparing for his senior season, but he also knows when he will be back in South Bend.